Can’t believe it’s almost been a year! Tyler and I were just talking about you. You are truly missed and the love we feel for you never waivers! 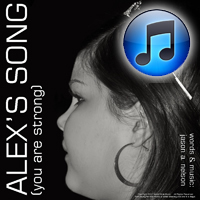 Many hugs and kisses to you dear Alex! I didn’t get the chance to meet Alex or her family, but I live in the Pinellas area and I’ve seen her stories and came across this page. Rest in Peace, Hun. I wanted to let Alex’s parents know my thoughts are with them. I was Alex’s 8th Grade Social Studies teacher and had known her since the 6th Grade. She was fun to know and teach. I remember her running around G Pod with her friend giggling and being scared of the dark hallway by Mrs. Emerson’s room. I hope her family finds peace. I did not know her.. but I would like to send out best wishes to her family and friends. She sounded like a wonderful person, that will surely never be forgotten. My grandmother passed away from cancer, and it was the hardest thing to cope with, so I can relate. Alex is now in a better place, and it’s great to know that she had so many people that loved her and stood by her side during her time. Thinking of you tonight. Hoping your mom and Tommy and Dad and family is doing o.k at this time of year…..
God bless. I hope my daughter Taylor is showing you your way around. She left us 10 years ago.